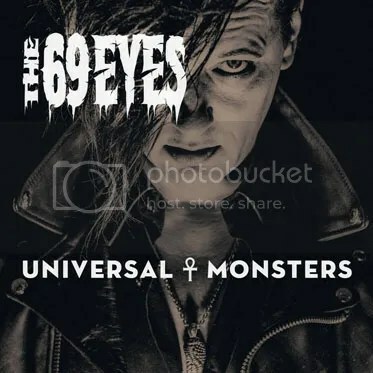 It’s funny – in an admirable way – how The 69 Eyes keep surprising us, after all these years, while releasing albums within the same parameters. Then again, I believe it’s simply called “talent”. If “X” was the band’s “pop album” (quoting Jyrki 69 himself), “Universal Monsters” is the rock one – hand-in-hand with that ever-present gothness, of course. You can tell that yourselves already, if you’ve listened to both singles the album has produced – the upbeat rhythm of “Dolce Vita” (those catchy piano keys and that spry guitar solo) and the fetching melody of “Jet Fighter Plane”; the pulse is stronger and yet they have The 69 Eyes seal all over them. Then things get a bit heavier with “Blackbird Pie”. And somber when, midway, some kind of Indian rain dance beats precede a beautiful semi-acoustic solo. Then watch them “gothicise” the Arabian feel of “Jerusalem”! What an exotic song that turned out! There’s also a Spanish guitar in the background of “Never”, so I dare saying that “Universal Monsters” may not use sounds from all around the universe, but it rolls quite internationally. “Saving the best for last” would be somewhat unfair, as the whole album is stellar, but “Rock’N’Roll Junkie” has indeed everything to become a hymn – the lyrics, that intro resembling The Rolling Stones’ “Start Me Up” and Jyrki’s vocal posture a tribute to David Bowie… yep, that one’s going down in the rock history. This entry was posted on 14th April 2016 at 2:34 am and is filed under CD, Rock with tags goth'n'rock, Gothic, Helsinki Vampires, Nuclear Blast, Rock, The 69 Eyes, Universal Monsters. You can follow any responses to this entry through the RSS 2.0 feed. You can leave a response, or trackback from your own site.